You will struggle to find this wine. The 2010 (featured in the Winter issue of Sumptuous) has been sold out for ages. But my local bottle shop almost always has something interesting tucked away if you do a bit of hunting. Andy brought a bottle of this home for me one day, and I returned a couple of days later and bought the last bottle. 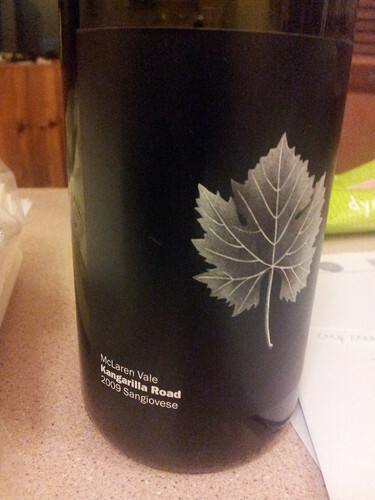 Kangarilla Road is a McLaren Vale winery with instantly recognisable labels: a black ground with an image of the vine leaf. Very striking and easy to spot. Sangiovese is something of a ‘thing’ in McLaren Vale. Its Old World home is Tuscany. I guess I’d describe the climates as being vaguely similar but Tuscany has some rolling hills and makes McLaren Vale look seriously flat. Despite its Tuscan pedigree, Sangiovese is actually part Tuscan and part Calabrian, and is actually found growing in many wine producing areas, under a variety of synonyms. For example, you can find Coriscan, American and even Swiss examples of this wine. In Australia it arrived in the 1960s but was not commercially planted until the 80s, with the first block being in Penfold’s Kalimna vineyard. The commercial pioneers are considered to be Coriole and Dromana Estate (Mornington Peninsula). I tasted this wine on 29 June, and the bottle had been open one day. In the glass, the wine was ruby in colour with medium intensity. The nose was quite pronounced: black cherry, vanilla, even blackcurrant. In fact, the blackcurrant was pushing towards blackcurrant jubes. There was a very slight green or herbaceous character to the nose which was a good thing as it balanced out the slightly confected jube notes. The black cherry was dominant on the palate, with firm, but not drying, tannins providing a lovely structure. There was some cedar spiciness and the wine had good length. I did wonder if the finish was perhaps a little hot, but that didn’t stop me heading back and buying the last bottle. This wine was purchased from Cellarbrations, Flagstaff Hill for $26.